Patients don’t always know if they’re taking their medication properly. 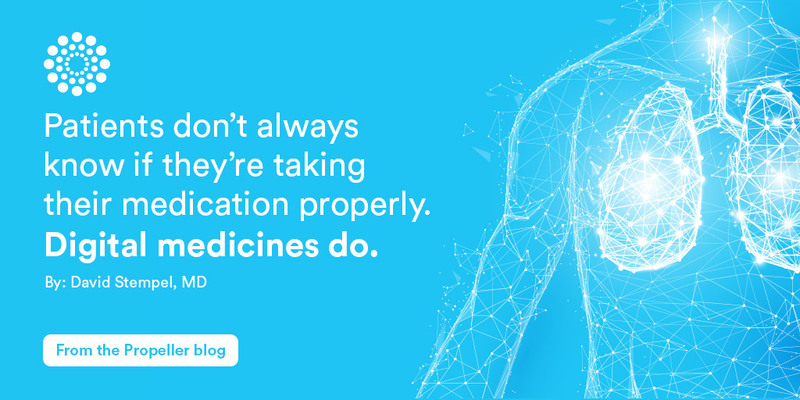 Digital medicines do. Every time Amy visited her pulmonologist, she braced herself for the same impossible question. This story illustrates a major problem for patients with asthma and COPD: with analog medicines, healthcare providers have no way of knowing exactly how often patients are taking their rescue medication. They want to believe their patients, but the patients themselves aren’t sure of the information they’re providing. Pharmacy refill history is available to a few providers, but most providers depend on the patient’s recollection. Dose counters can be helpful, but they don’t show patterns over time, only the total number of doses taken since the last visit. They’re also only representative of the inhaler the patient is carrying that day. When providers don’t have a clear picture of how often their patients need medications to relieve their symptoms, and whether they are taking their daily controller, it can be challenging to appropriately adjust their treatment. For their part, many patients with uncontrolled asthma think they are doing well. They don’t realize that with today’s treatments, they should expect to live without symptoms and be able to participate freely in the activities they choose. This is where digital therapeutics come in. In a poster presented at ERS 2018 with the University of Colorado School of Medicine and Children’s Hospital Colorado Breathing Institute, Propeller reports the results of a study of electronic medication monitoring to determine differences in inhaler use among patients with asthma and COPD. The study, which focused on a group of adults (40+ years) with asthma or COPD, monitored use of rescue and controller medications for 30 days using electronic medication monitors attached to their inhalers. The sensors passively collected the date and time of each inhaler actuation, allowing the team to examine daily rescue and adherence use stratified by diagnosis, age and gender. The team found that patients with COPD used their rescue inhalers more than patients with asthma, even when controlling for age and gender. This finding illustrates the difference between the two diseases and the need for different strategies in helping patients manage their asthma or COPD. We also found that increasing age for both diseases was associated with better adherence, in that patients 60+ generally had higher adherence than their younger counterparts. This type of data gathering clearly demonstrates the value of integrating digital medicines into daily healthcare delivery: When we understand more about the burden of our patients’ illness and how they are treating it, we have the potential to better treat their disease. This data reveals the power of digital medicines to inform clinical practice. It highlights that even though similar medications may be used to treat different diseases, alternative approaches are needed for each illness. With electronic monitoring data, providers have more objective information on the patients they’re treating. They can identify patients who require more coaching and follow-up between regular appointments and make sure to target interventions to patients who may be at risk for poorer outcomes. And they can better assess whether a patient is managing their disease well. The use of digital tools to gather data on medication use is an important piece of the puzzle as we move toward the use of more objective information in healthcare decision-making. By removing the burden on patients and providers to track medication use, we can focus more on delivering personalized care. Let’s start taking the burden off providers and patients to track inhaler use and use digital medicines to not only track, but deliver objective insights on their disease. This research will be presented at the ERS International Congress 2018 by experts from Children’s Hospital Colorado Breathing Institute and the University of Colorado School of Medicine, using data provided by Propeller Health.